The most important reason to have a VHF radio on board you vessel is safety. The U.S. Coast Guard will soon have national coverage for DSC reception. The SPECTRUM+ features the official U.S. Coast Guard recognized version of this technology. 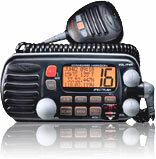 In an emergency the SPECTRUM+ is capable of sending an automated, unattended, continuous, digital MAYDAY message that includes current vessel position time/day and a FCC assigned vessel identification. By design, the DSC MAYDAY will be digitally received by the Coast Guard, all commercial vessels and any other vessel equipped with a DSC radio. This digital safety feature insures prompt assistance eliminating critical mistakes in MAYDAY transmissions that occur when operators are under stress. To increase your sense of security the SPECTRUM+ also receives digital acknowledgements alerting the radio operator that the vessels distress call has been received. Of course the DISTRESS Key is properly protected with a cover to reduce the possibility of an unintentional activation. In addition to transmitting a DSC Distress call the INTREPID+ can show a vessel in distress when a DSC distress is received simply by connecting any STANDARD HORIZON GPS Chart plotter to the INTREPID+. This allows you to exactly see and navigate to the vessel in distress. Also, SPECTRUM+ allows the user to exchange position data with a fellow cruiser or fisherman with its POSITION REQUEST or POSITION SEND functions. When connected to a STANDARD HORIZON GPS Chart Plotter, these positions are actually shown on the display. Should it become necessary to notify all of the vessels of a commercial fleet or towing service, the GROUP CALL feature makes it simple. DSC Position Polling Advancements in DSC have made it possible to poll the location of another vessel and show the position of that vessel on the display of the SPECTRUM+. Standard Horizon has taken this feature one step further, if any Standard Horizon GPS is connected to the SPECTRUM+ the polled position of the vessel is shown on the display of the GPS chart plotter making it easy to navigate to the location of the polled vessel. This is a great feature for anyone wanting to know the position of anther vessel for example you buddy that is catching fish, or finding the location of a person you are cruising with. DSC Position Send The feature is similar to Position Request, however instead of requesting a position of another vessel this function allows you to send you position to another vessel. Your vessel must have an operating GPS receiver connected to send the position. When another INTREPID+ or SPECTRUM+ equipped vessel receives your position, the transceiver outputs a the position to NMEA DSC sentence which may be used by any a Standard Horizon GPS chart plotter to show your position on the receiving transceiver. When connected to you GPS position receiver the SPECTRUM+ will display time, date, Latitude/Longitude, Speed Over Ground (SOG), and Course Over Ground (COG). Of course the time clock features an offset to compensate for local versus UTC. GPS repeatability insures the accurate and safe transmission of your location in an emergency or when you are attempting to meet a fellow cruiser. Foul weather can lead to unsafe boating conditions. The SPECTRUM+ features a built in 20-Watt Loud Hailer with 4 selectable, preprogrammed foghorn signals. In addition to broadcasting the appropriate fog signal for your vessel, the listen back feature receives and amplifies a return horn, further reducing the possibility of a collision. The hailer software in the SPECTRUM+ also includes a horn, siren, aground and yelp signals and bells. The SPECTRUM+ has the capability of being connected to a submersible full-featured Remote Access Microphone (RAM Mic). This advanced remote operates as a full-powered second station to the SPECTRUM+ at the flybridge, cockpit, tower or location of you choice. The RAM incorporates a remarkably large LCD with a speaker microphone that allows the user to remotely access most of the VHF functions of the SPECTRUM+. A 23-foot routing cable (extendable to 43-feet with 10-foot extension cables) and waterproof bulkhead mounting connector insure a clean professional-looking installation. SPECTRUM+ highlights scanning of user selected channels or priority scanning of any channel. Additionally, SPECTRUM+ features 10 NOAA weather channels including weather alert allowing SPECTRUM+ to intercept frequency encoded regional Emergency Weather alerts. The HUGE LCD display provides visual indications for all scanning functions in a bold easy to understand flags. SPECTRUM+ features a uniquely designed waterproof microphone. Clear Voice, STANDARD HORIZON innovation, provides the clearest possible transmission, by significantly reducing wind and engine background noise. In addition to its unique noise canceling capabilities, the SPECTRUM+'s microphone features a speaker, up/down and 16/9-channel selection. The Spectrum is covered by STANDARD HORIZON's exclusive 3-year Waterproof Warranty. If your STANDARD HORIZON radio fails for any reason, including water damage, during normal use in the first 3 years, STANDARD HORIZON will repair it without hassle or charges....period! If it fails thereafter in normal use for as long as you own it, our unique Lifetime Flat Rate Service Program will cover it. Flat rate is established at time of original purchase based upon the factories current rate. Consult STANDARD HORIZON or your dealer for details.